Make upgrading your mirrors a snap with K Source snap-on custom towing mirrors! These mirrors will increase your range of view, are totally adjustable, and are easy to take off when not needed. Custom tow mirrors from K Source offer a high quality, low cost solution to your towing needs. When you're pulling a boat or camper down the highway at 70 miles per hour, you want to be as safe as possible. These side view mirror additions allow you to do just that. They are fully adjustable rather than a fixed mirror you might find elsewhere and they are custom designed to fit your factory mirrors to eliminate extra noise & vibration. Your new K Source snap-on custom towing mirrors install in just seconds without the need for any tools. They simply snap on or off over the back of your factory mirror. Talk about a piece of cake! Since they snap on & off, you can take the tow mirrors off your truck when not needed. Get a pair of custom tow mirrors for your truck and see for yourself how much easier it is maneuvering a trailer when you have that extra field of view! Your new tow mirrors will come backed by a 90 day warranty against any defects in materials or workmanship. If you have any questions, give us a call and we'll be happy to try and help you out! 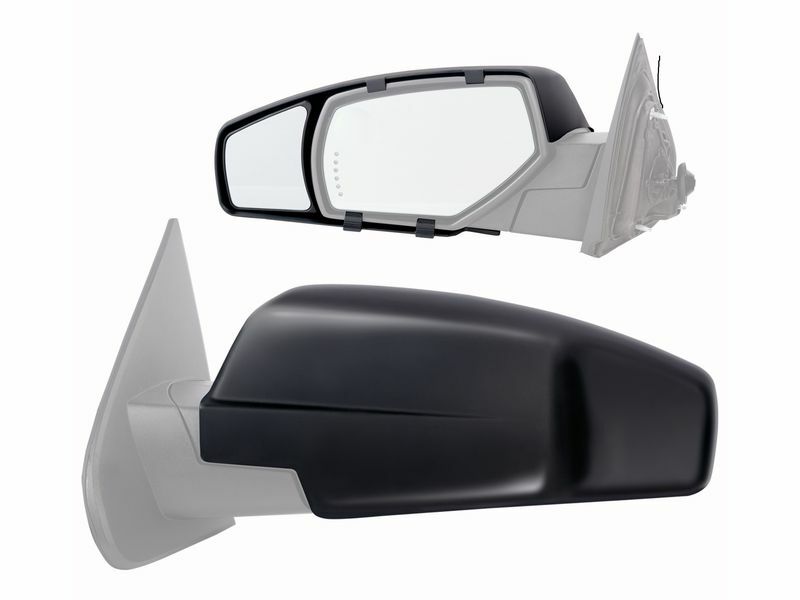 Each of these tow mirrors is designed to just snap-on right over your factory mirror. This keeps the installation as simple & easy as possible. There won't be any drilling or cutting needed to install your new mirrors. Give us a call if you think of anything that we can help you with or if you want to find out how the fish are biting, give us a call!